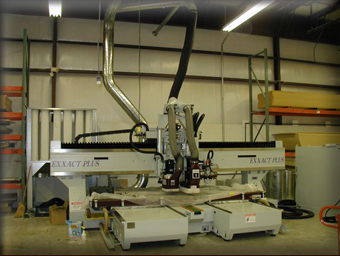 Wade's Woodworking is capable of machining custom parts in various materials including but not limited to MDF, plywood, particle board, melamine board, solid surface materials, acrylic, plastic, fiberglass, solid wood and many more. Our CNC routers have several technologically advanced features including 32mm line boring, horizontal boring, 3D machining as well as performing multi-drilling functions. The router can process full sheet nesting for up to 5’ x 12’ material. It has various cutting capabilities including radius cuts, quirks, kerfing, blind dadoes, rabbits and grooving. It also has the capability to engrave or raise lettering. To ensure the highest quality of your parts, a prototype is developed prior to machining the entire order.